If you think of visiting London you probably don’t immediately think fish, unless they are in batter, but London does have a world-class aquarium right on the banks of the iconic River Thames. 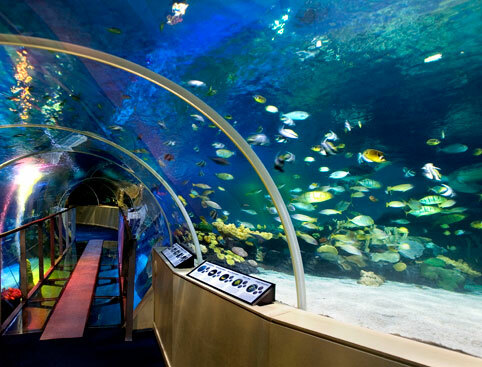 Check out the Top Sights Guide below to plan a nice trip to the aquarium after a great tour. Originally opened as the London Aquarium in 1997, SEA LIFE attracts more than a million visitors each year, and is the largest aquarium in London. Not only does the SEA LIFE London Aquarium provide hours upon hours of entertainment for visitors as they watch sharks, turtles and tropical fish swim over, under and all around them, it’s also one of the UK’s leading centres in marine management, conservation and preservation in marine animal welfare. The aquarium has different zones dedicated to specific areas of the world and the marine animals that reside in them, such as “Pacific Wreck,” “Rainforests Of The World,” “Seadragon Kingdom,” “Shark Walk,” “Penguin Point,” “Ocean Tunnel,” “Dive Discovery,” and much, much more. Besides being home to countless sting rays, turtles, catfish, crabs, piranhas, and crocodiles, the aquarium also houses some of the rarest and most beautiful marine animals in the world, such as the bowmouth guitarfish, lionfish, blind cave fish, and even poison dart frogs. The Aquarium is correctly known as Sea Life London Aquarium, part of the chain of Sea Life centres and one of the biggest aquatic collections in Europe. The Aquarium has over 500 species of fish and over 2 million litres of water, sitting, unexpectedly, beneath the historic and beautiful County Hall building. It’s next door to the awesome London Eye and almost directly opposite The Houses of Parliament. From walking over a glass window and watching sharks swim under your feet in the Pacific display, to gawking at sand eels, snails and octopus in the Atlantic Zone, strolling through the SEA LIFE London Aquarium will make you feel as if you’re diving into the depths of the world’s biggest oceans. Sea Life London is a great way to introduce your children to the creatures of the sea and a great family attraction to visit whilst in London.